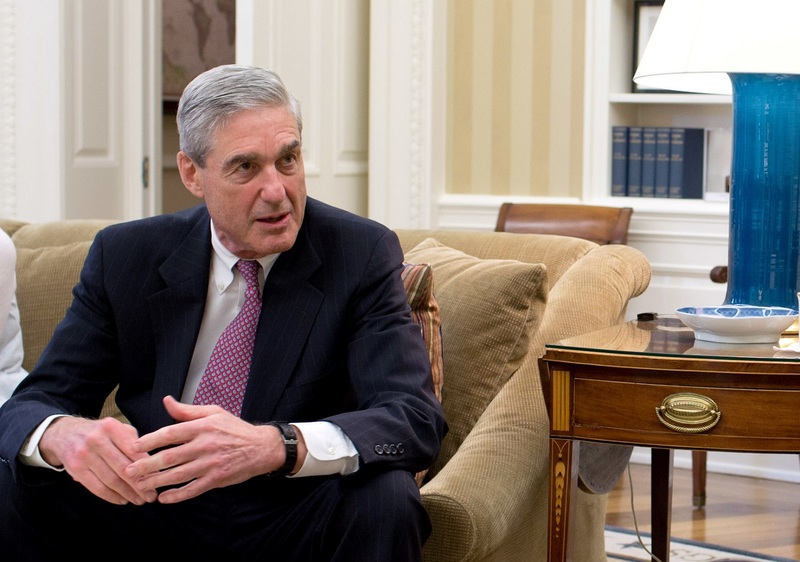 I’ve written before how I think Conspiracy to Defraud the United States (ConFraudUs) provides Mueller a way to charge a variety of conduct with conspiracy charges that additional defendants can be dropped into, all of which might form an interlocking series of ConFraudUs indictments that map out the entire election crime. 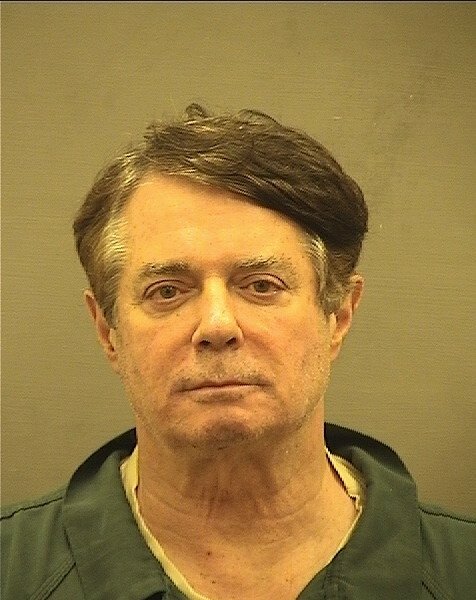 In this post, I observed how the charge worked in the Manafort and Internet Research Agency indictments. In this one, I described how it might work to charge Jared (and everyone else) for pretending to be serving US foreign policy interests while actually making bank. In response to a challenge from Concord Consulting in the IRA indictment, the Mueller team has laid out how they think of ConFraudUs. The filing hints at how and why they may be using this as a backbone for their pursuit of the 2016 election tampering culprits. 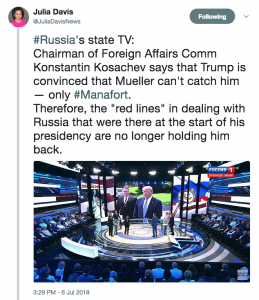 Violations of the federal campaign laws and foreign agent registration … require the defendant to have acted “willfully,” say the Russians who trolled our election. Then points out they haven’t charged those underlying crimes. They’ve just charged ConFraudUs. And the standard for ConFraudUs is “intent to defraud the US;” there’s no “willfullness” standard required. Basically, the Mueller team argues, Concord and all its trolls only have to agree to pull a fast one on the American electoral regulatory apparatus, with at least one overt act like … a trollish tweet. They don’t have to individually willfully violate the underlying law. We’ll see what Judge Dabney Friedrich has to say about this argument (though as far as I understand it, the Mueller argument is not at all controversial). As a reminder, Rick Gates has already pled guilty to this charge. However Friedrich rules, however, you can how this would apply to a number of other known actions. 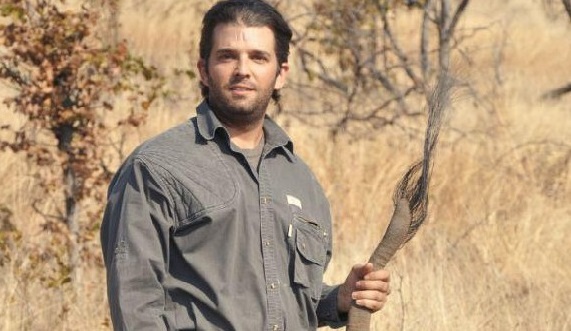 Did Don Jr conspire with Aras Agalarov and his surrogates to defraud the fair management of elections when he stated, in the context of receiving dirt on Hillary Clinton, that he would revisit the Magnitsky Act sanctions when his father won the election (several witnesses gave sworn testimony that this happened)? 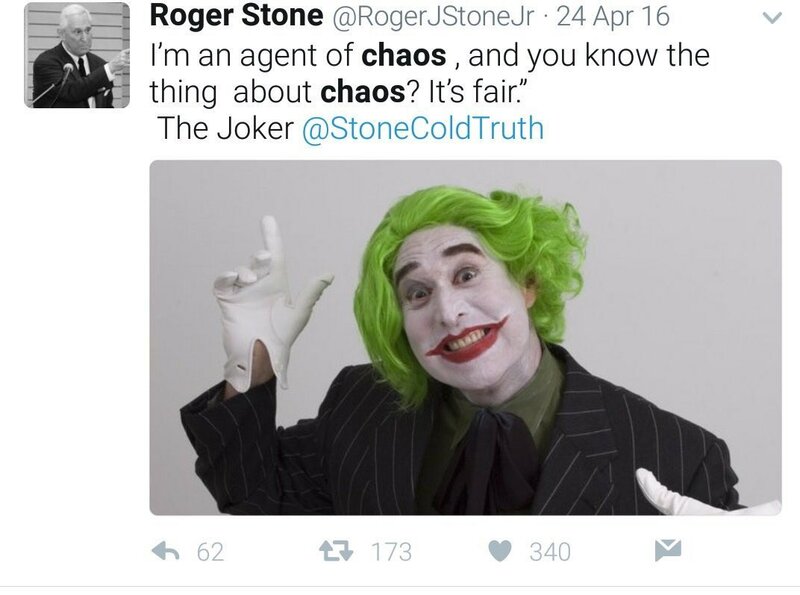 Did Roger Stone conspire with Guccifer 2.0 when they (as reported but not yet substantiated with evidence) discussed how to find Russian hackers who had stolen Hillary’s emails? Did Brad Parscale conspire with Cambridge Analytica, not just to permit foreigners to illegally provide assistance to the Trump campaign, but also to use stolen models to heighten discontent among Democratic voters? 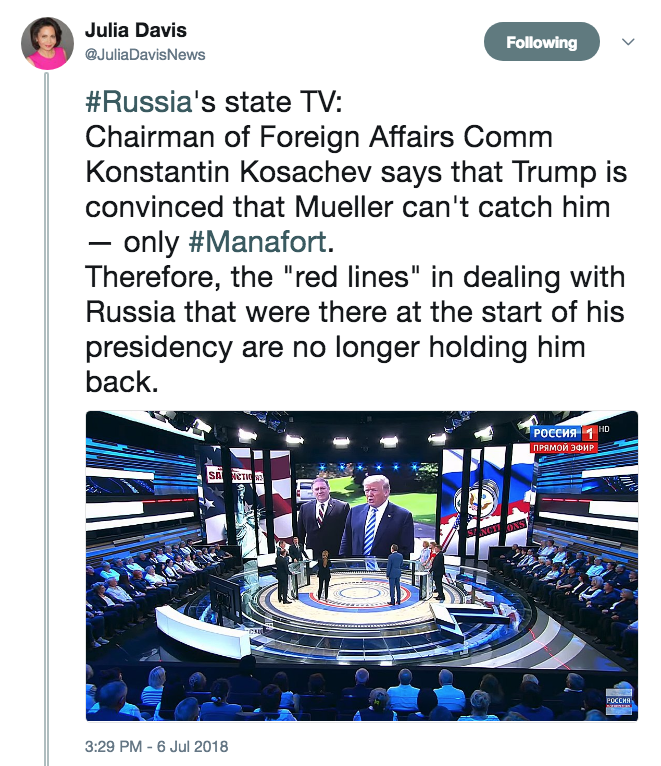 Importantly, Mueller would not have to prove that all participants in all these conspiracies had the mens rea required by the underlying charges. It’s enough that they’re trying to deceitfully thwart the lawful functioning of a government process. 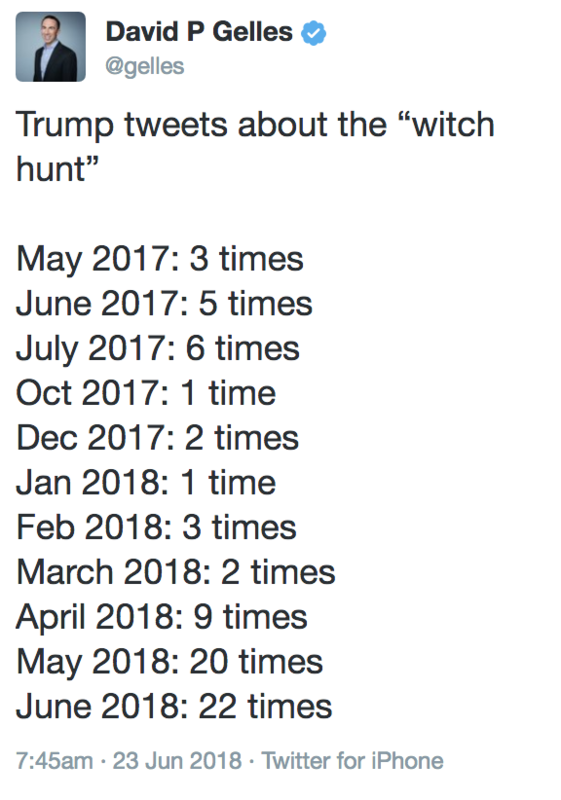 Obviously, Mueller hasn’t yet charged any of these ConFraudUs conspiracies, if indeed they happened. But you can see why he might use ConFraudUs to do so. I think this story is both less and more than people are making it out to be. It’s being overhyped for its facial value. Of course Mueller is going to ask about what the president knew and when he knew it. Of course he’s going to chase down whether Roger Stone’s repeated claims to know what was coming were bluster or not. But on at least two counts, I think there’s more to this story than meets the eye. First, as I noted when George Papadopoulos’ plea came out, the FBI charged the former foreign policy advisor for lying about whether he had been told of dirt on Hillary in the form of emails (which we now know they said they might anonymously leak to help Trump) before or after he joined the campaign. That they believed this important enough to charge suggests that, after two full months of cooperation, they got the answer they expected. But we can be pretty sure what the answers are. There’s no way Papadopoulos’ plea would have been rolled out in the way it was except to get everyone he had told about the emails (as well as those who were instructing him on how to negotiate a meeting with Putin) on the record first. These questions are also interesting against the background of something else suggested by the Papadopoulos plea (and subsequent NYT reporting), which I laid out here. 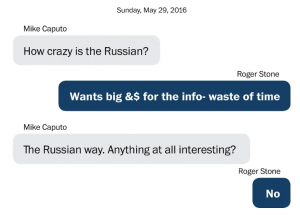 Papadopoulos appeared to be signaling Ivan Timofeev, and those signals were closely tied to email releases. 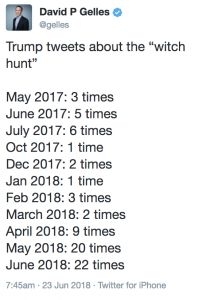 In this post I did a timeline of all the known George Papadopoulos communications. The timeline made something clear: on two occasions, Papadopoulos alerted Ivan Timofeev to something in a Trump speech. On each occasion, something happened with emails. I’m not saying that the timing of these email releases were dictated by the speeches. Of course they weren’t. They were timed to do maximal damage to the Hillary campaign (not incidentally, in a way that coincided with the “later in the summer” timing Don Jr asked for in his communications with Rob Goldstone). Importantly, that signaling pertained to public statements on policies of Russian interest. I laid out three apparent incidences in that post, incidences mentioned in the plea. 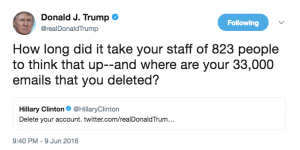 In this post, I suggested what might be a fourth: when Trump’s twitter account tweeted about Hillary’s emails just 40 minutes after the June 9 Trump Tower meeting started and incorporated a potentially accurate number for how many staffers Hillary had. 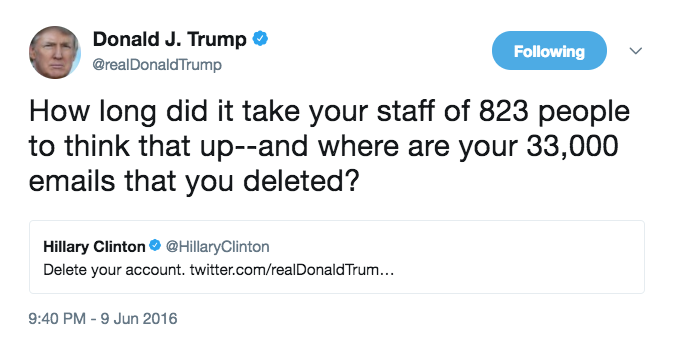 I want to return to a detail many others have already noted, Donald Trump’s tweet, just 40 minutes after the Trump Tower meeting started, referencing Hillary emails (albeit the ones she deleted off her server, not the still secret stolen ones). I’m at least as interested in why Trump (or rather, Scavino or Parscale or Don Jr) used the number “823” in the tweet. In the aftermath of the John Sipher interview Jeremy Scahill did, Sipher suggested to me might be some kind of signal, a code; he’s the pro–maybe he’s right. If this (or, specifically mentioned in the NBC story, Trump’s July call for Russia to release Hillary’s emails) were part of the signaling, then Trump either could have been in the loop, or one of the flunkies who ran his iPhone account before he switched to iPhone himself could have been. Which leads me to one more question reported by NBC today, almost as an afterthought. At least one witness was asked about the boundaries of Dan Scavino’s job. At least one witness has been asked about Trump aide Dan Scavino, specifically about any involvement he may have had in the campaign’s data operation. Scavino currently runs the White House’s social media operations and is one of Trump’s closest aides. I’m particularly interested in this given the report that Scavino was involved in negotiations through Rob Goldstone for promotions on Russian social media platform VKontakte, and the odds that he might have been the one tweeting any signaling tweets using Trump’s campaign. So while these questions are, on the one hand, bloody obvious, they also may suggest a far more advanced understanding of how this operation might have worked. Trump’s Campaign Didn’t Use Cambridge Analytica’s Pyschographics; Did His SuperPAC? In the wake of news that the head of Cambridge Analytica, Alexander Nix, offered to help Julian Assange with the stolen Hillary emails, Wired has a good story on what Trump’s campaign did with CA. In general, it says that the campaign did not rely on CA’s data, nor did it use CA’s famed psychographics based in part of Facebook data. That may sound like a small distinction, but it’s a crucial one. Ever since it burst onto the scene of American politics in 2015, Cambridge has trumpeted its massive data trove, boasting 5,000 data points on every American. Cambridge claims to have built extensive personality profiles on every American, which it uses for so-called “psychographic targeting,” based on people’s personality types. It is feared by some, including Hillary Clinton, for conducting a kind of psychological warfare against the American people and dismissed by others as snake oil. Both Parscale and Oczkowski have said repeatedly that the Trump campaign did not use psychographic targeting. In fact, however, the story suggests Trump’s campaign did use CA data for a month, in July, because the RNC wasn’t yet sharing its data with Trump. According to the WSJ, July is when Nix reached out to Assange. But there’s another implicit revelation in the story: in explaining why he didn’t know about Nix’s outreach to Assange, CA chief product officer Matt Oczkowski, who led CA’s efforts with the campaign, said that they were walled off from CA because of rules prohibiting cooperation between campaigns and SuperPACs. “I had absolutely no understanding any of this was going on, and I was surprised as everybody else when I saw the story” about Nix’s approach to Assange, Oczkowski says. During the campaign, he says his team was walled off from the rest of Cambridge, because the company was also working with a Trump Super PAC. Which of course suggests that CA was embedded even more with the SuperPAC. And that, in turn, raises a slew of other questions. For example, did people who left the Trump campaign — most notably Roger Stone — have any ties with the SuperPAC? After all, Stone had a role in efforts to find Hillary’s emails and surely a bunch of other rat-fuckery (because that’s what rat-fuckers do). So did the wing that was openly asking Russians for help also have closer ties to the more sordid aspects of what CA does? https://www.emptywheel.net/wp-content/uploads/2016/09/mars-mro-orbiter-gale-crater-HiRISE-ESP_043961_1740-PIA20167-full.jpg 960 1280 emptywheel https://www.emptywheel.net/wp-content/uploads/2016/07/Logo-Web.png emptywheel2017-10-27 11:12:552017-10-27 11:12:55Trump's Campaign Didn't Use Cambridge Analytica's Pyschographics; Did His SuperPAC?